When you’re competing with mass-produced lithium-ion batteries, every bit of cost reduction counts. The dominant energy storage technology benefits from massive economies of scale. Flow batteries, a major class of alternative storage technologies, lack that scale, and some require vanadium, a material whose price has shot up in the last three years. A new business model innovation could lower the price for vanadium flow batteries, nudging them closer to competitiveness with lithium: rentable electrolytes. Flow battery acolytes have murmured about this for some time now, but it finally happened in the field. Flow company Avalon Battery lowered the upfront price tag of a recent deal by renting rather than buying its key ingredient. Commercial customer Sandbar Solar in Santa Cruz bought the flow system from Avalon as part of an off-grid microgrid installation. Meanwhile, it rented the vanadium from a not-yet-identified supplier under a 10-year rental contract with an option to extend. 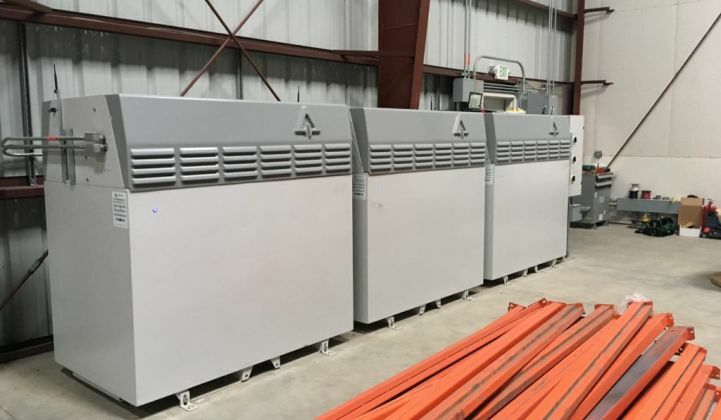 A 10-year vanadium rental arrangement eliminates about one-third of the upfront capital expense of a flow battery purchase, said Matt Harper, president and chief product officer at Avalon Battery. That expense doesn’t disappear: The annual rental payments will ultimately gobble up around 70 percent of those savings. The key is that it turns a large upfront charge into a smaller one. That’s especially welcome given the tumultuous recent history of vanadium markets, which spiked in late 2018 after steadily rising for several years. “If a vendor can figure out a way to bring down capex costs for flow batteries, that will definitely open new doors for this technology to make its way into the market, because pricing is one of the challenges flow vendors have been facing,” said Mitalee Gupta, energy storage analyst at Wood Mackenzie Power & Renewables. Lithium-ion systems in the 4- to 6-hour duration range currently cost roughly half as much as flow batteries on a per-kilowatt-hour basis, Gupta said. That means that chopping a third off the upfront flow battery price would narrow the price differential, but not eliminate it completely. (Other factors, like manufacturing scale, will play a role here as well). Deferring payments for the electrolyte also improves the cash flow accounting for a system compared to buying the vanadium outright, said Josh Weiner, who has worked with Avalon Battery products as CEO of SepiSolar, a design engineering firm specializing in solar-plus-storage. Lowering the upfront investment improves the internal rate of return for a project. Additionally, because money now is worth more than money in the future, pushing back payments for the vanadium improves a project’s net present value, Weiner said. The rental relies on the basic chemistry of flow batteries: After years of use, it’s possible to remove the liquid electrolyte and reclaim the valuable components without too much hassle, Harper said. That means that a company in the business of selling vanadium could instead rent it out for a couple of decades to a flow battery project, get paid for that service, then extract the vanadium and sell it off at the end of that time. Within the flow battery community, the major fault line divides vanadium companies from everybody else, and the “everybody else” camp likes to bring up the price of vanadium as a reason to steer clear of that chemistry. Zinc flow company ViZn made that argument explicitly in its recent push into China. CEO John Lowell told Greentech Media that ViZn is chasing the market segment of customers who wanted vanadium flow batteries but put plans on hold when the commodity price went through the roof. The counter-vanadium argument posits that it’s hard enough to make flow batteries competitive with lithium-ion, and baking in the materials cost of vanadium will keep that goal out of reach. Companies like ViZn and ESS tout the cheap, commonplace materials they use for active components (zinc and iron, respectively). Strategic arrangements with vanadium suppliers offer a workaround for high prices. For his part, Harper said he investigated a range of chemistries and that vanadium worked the best. The current pricing trend shouldn’t rule out the material in the long run, he added. “It’s a processing-limited resource; it’s not a supply-limited resource,” he said. In other words, the price spike has more to do with current production capacity relative to demand. High prices drive more investment into the space, and that investment will continue if new end uses (like flow batteries) start driving additional revenue. That also explains why a massive global mining conglomerate would bother taking a chance on a small behind-the-meter battery in Santa Cruz. “They see all the forecasts,” Harper said. If the more bullish scenarios come true, renewables development will break open a massive market for long-duration storage, and if vanadium flow captures a chunk of that, it would represent an attractive new revenue stream for the minerals suppliers. That gives them a stake in helping this fledgling storage alternative get off the ground.